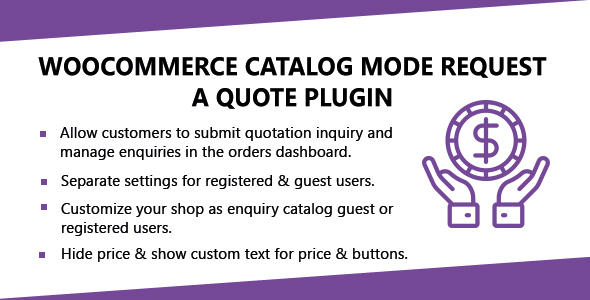 Allow customers to enquire about your products and turn your store to catalog mode for any time. The plugin allows to convert your store to catalog mode and your customers will be able to submit enquiries against each product. The plugin allows to hide price & show some custom text instead of price. Customize complete shop for quotation enquiries. Allow customers to submit quotation inquiry and manage enquiries in the orders dashboard. Separate settings for registered & guest users. Customize your shop as enquiry catalog guest or registered users. Hide price & show custom text for price & buttons. Customize shop settings to change button text for add to cart, proceed to checkout, place order.